This project created two new spaces in the home – a well lit sitting room and an open deck to take in the backyard view of the forest. 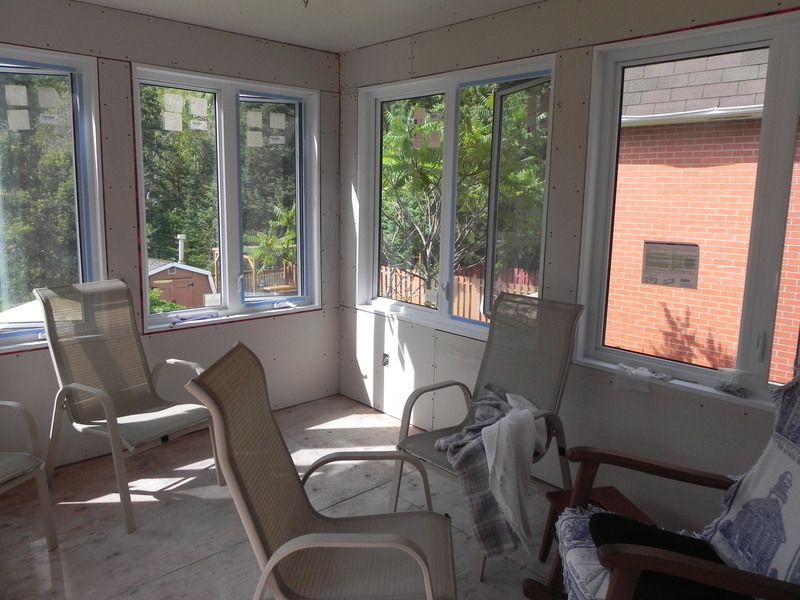 The 129 square foot four season room provides the homeowners with an area to enjoy the sun no matter the season. The room is equipped with both heat and AC which are separate from the previous area of the home. The 144 square foot open deck includes a privacy wall and is home to the family BBQ (reducing travel time from the previous location and having to go through the basement or around the home). The addition is elevated and is situated over a walkout basement. The foundation utilized steel teleposts into the soil, which share the load of the structure along with a ledger board through the existing brick veneer. An existing window was removed from the main storey of the home, and the opening enlarged to install a new French door to access the addition. A wood/aluminum guard was chosen for the deck, along with 5/4″ decking, brown pressure treated lumber, and louvers for the privacy wall.